Head coach Mike Lonergan with guard Maurice Creek on the sidelines on Friday night. RALEIGH, N.C. — You knew the ball would be in his hands, down three points with 9.6 seconds left. You knew it would be Joe McDonald dribbling up the court before finding graduate senior Maurice Creek for the potential game tying three-pointer. And you knew he missed as soon as the ball left his hands. GW’s final shot in their first NCAA Tournament since 2007 sailed wide left as all the air evaporated from the arena. Memphis walked away with a 71-66 victory. This isn’t how these games are supposed to end. The plucky, easy-to-root-for team with an enthusiastic head coach is supposed to make the shot to tie the game. It seemed pre-ordained. That the narrative of March Madness demands the game ends with buff and blue euphoria. But the shot went wide. 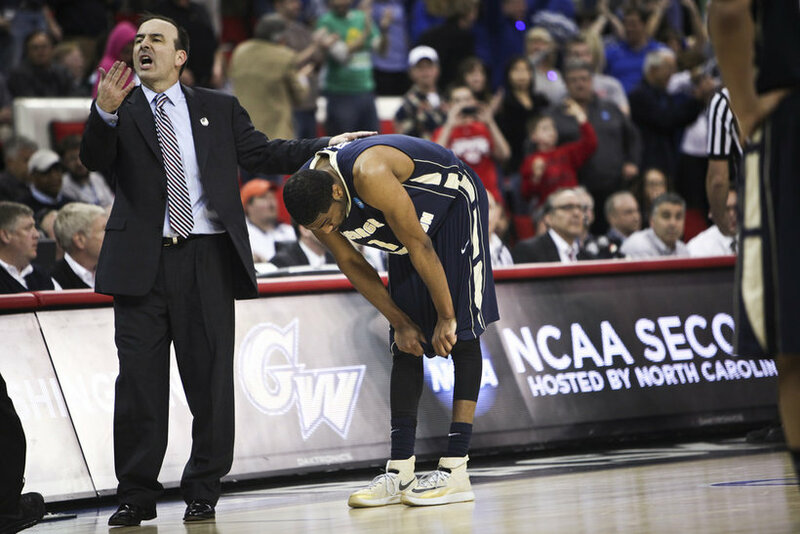 The dream season for GW and head coach Mike Lonergan had come to an end. And as Creek stood alone away from his teammates as Memphis hit a pair of inconsequential free throws, I couldn’t help but feel sorry for him. The last attempt of his collegiate career had gone agonizingly wide. For Creek, it was a poor shooting night as he made just two threes — they were the only baskets he made in 13 attempts. GW’s leading scorer on the season could only muster nine points, still a gutsy performance after getting 10 stitches in the first half. There is no worse feeling in sports than that of a season ending loss. For Creek, the feeling is compounded by the realization that his final game in college basketball ended with an airball. It was painful to listen to Creek recall his final attempt. It was equally painful to look at senior Isaiah Armwood seated next to Creek at the podium. Armwood shared in Creek’s despair, tears welling in his eyes. He was the Colonials leading scorer with 21 points and a key architect in the Colonials’ battle to keep the game close, scoring 15 in the second half. But it would be his last game for the Colonials. But at the end, it just didn’t fall.